First Millie Villarreal had digestive issues. She wasn't worried. Then she was diagnosed with cancer. Still not worried. She was told more than half her stomach needed to be removed. Again, not worried. "My faith strengthened after my husband died, and I know that everything is in God's hands so why should I go crazy?" she said. "I also had uterine cancer when I was 28 and it was caught at the beginning so I was able to get rid of it pretty easily." Millie, who was 66 when her stomach cancer was diagnosed, found that this time the disease would not be so easy to treat. But she had complete trust in her doctors, Dr. Rosanna Modesto, her long-time internist and Dr. Hee Yang, a general surgeon who specializes in gastric cancers, at Holy Name Medical Center. Together, they came up with a personalized plan to treat Millie's specific cancer. It looked to be a daunting undertaking, but Millie was calm and ready. "Dr. Modesto is like family, not just my doctor and Dr. Yang is just so reassuring," Millie said. "From that first meeting, they put me at ease." Millie needed surgery, followed by chemotherapy and radiation. "Dr. Yang was so very professional and told me exactly what was going to happen," Millie said. "He needed to remove 65 percent of my stomach. I joked and told him to make sure he put all the parts back together correctly so they would work again. "Then on the day of my surgery, I took his hands and prayed while holding them - praying that God would guide his hands," Millie said. "It's good insurance - you never know." After her nearly four-hour surgery, Dr. Yang told Millie he had to remove more of her stomach than expected - 85 percent, to make sure he got all the cancer. But he came to check on her and had her up and walking the next day. "During my hospital stay everyone was so great to me - I can't say enough about the people who work at Holy Name," Millie said. "The nurses were my angels and the staff, anesthesiologists, everyone was so professional and friendly." A month later, when she met with Dr. Yadyra Rivera, chief of hematology/oncology, Millie had a surprise waiting for her. 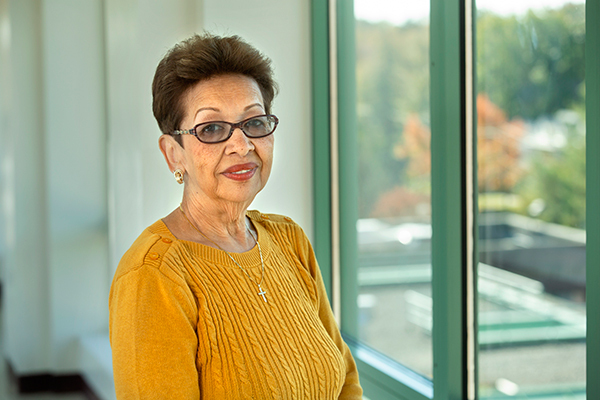 "Dr. Rivera said she checked with another doctor, just to be sure, and they both agreed that based on my lab reports and screenings, I didn't need any further treatment," Millie said. "She told me she went over everything several times and I was clean. I didn't need chemo or radiation." While Millie was thrilled she didn't need additional treatment, she admitted it took a little while to adjust to having a smaller stomach. She had to eat smaller amounts of food and couldn't drink and eat at the same time. But she adjusted rather quickly and in the meantime, lost some pounds she had been trying to shed for years. Only two months after surgery, she was back to her job selling real estate, teaching catechism and serving as a Lector and Eucharistic Minister in her church. She also spends as much time as possible with her daughter and son, who both later had gallbladder surgeries with Dr. Yang. "I sing Dr. Yang's praises to anyone who needs surgery," Millie said. "He's gentle, compassionate and knowledgeable and I can't even begin to tell you how calm he makes you feel. He is exactly what you want in a doctor. "Today, I'm happy spending time with my children and grandchildren and eating a whole slice of pizza!" she said. "That's enough - I don't need more than that. I feel great - I was confident I would be okay and I am."